Andrew Scheer and the federal Conservative party have a plan to crack down on guns and gangs. Scheer’s plan is a simple one: End automatic bail eligibility for gang members, revoke parole for gang members and impose minimum sentences for some gang-related offences. Scheer says that his plan, unlike Justin Trudeau’s plan that puts criminals first, will keep Canadians safe. But simple plans are often the product of simple minds and, worse yet, Scheer’s plan is built on a foundation of half-truths and unconstitutionality. So, join me as we take a trip of discovery, point by disingenuous point, through Scheer’s gang plan. Situation one: A known gang member is arrested. Scheer’s claim: Under Trudeau, the gang member is automatically eligible for bail. Scheer’s plan: Automatic detention and the accused must prove they should be released. Every person accused of a crime is automatically eligible for bail and, usually, because of pesky principles such as the presumption of innocence, it is the state that must show why detention is necessary. Perhaps the accused is a flight risk or maybe there is a likelihood that they will commit further offences or, in rare cases, their release could undermine confidence in the justice system. In any of these cases, gang member or not, the accused will be detained. But, in some cases, the script is flipped and the onus shifts to the accused. If the accused was already out on bail or the offence involved a firearm, terrorism or the trafficking of hard drugs, it is then the accused who must show why they should be released. And what about gang-related crimes? It is already the case that when an offence is alleged to have been committed for the benefit of or at the direction of or in association with a criminal organization, it is the accused who must prove why they should be released. Scheer’s proposal adds nothing but torqued rhetoric. But Scheer not only simply misrepresents the current state of the law he also suggests a radical and unconstitutional expansion of reverse-onus bail provisions. Scheer’s plan is a recipe for racism and discrimination. Left undefined, the word “gang” is often a dog whistle. Scheer’s plan is also highly unconstitutional. Under the Conservatives, a “known gang member” with no prior criminal record who steals a chocolate bar would face a reverse-onus bail situation. This is a state of affairs that no court would ever let stand. Situation two: A known full-patch biker gang member is arrested. Scheer’s claim: Under Trudeau, prosecutors must prove the known biker gang is a criminal group. Scheer’s plan: The known biker gang is considered a criminal group. Yes, sometimes, prosecutors need to prove things. That’s sort of their job. But it is not difficult to prove the Hells Angels are a criminal organization. 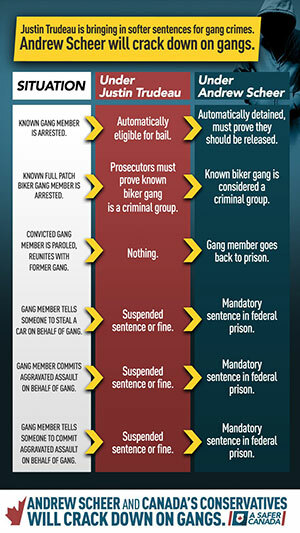 Scheer offers no details by which criteria these “known gangs” will be defined. Nor is there any evidence that the small step of proving that an organization meets the current definition of a criminal organization has imperilled prosecutions or resulted in decreased public safety. In short, this Scheer proposal is a solution in search of a problem. Situation three: Convicted gang member is paroled and reunites with former gang. Scheer’s claim: Under Trudeau: nothing happens. Scheer’s plan: Gang member goes back to prison. When someone is released on parole, they are still serving their sentence and there are always conditions attached to that parole. Those conditions almost always include non-association conditions. The terms can be very specific (to not associate with named people) or very broad (to not associate with anyone with a criminal record). Any violation of those conditions results in the automatic revocation of parole and a return to jail. It is an outright lie to say that if a gang member is released and reunites with their former gang, nothing happens. And remember how broad the definition of a “gang member” can be. Scheer’s plan will result in the imprisonment of a disproportionate number of racialized minorities for simply returning to their neighbourhoods. And courts tend to frown upon laws that are so broad and vague that they could result in the deprivation of liberty without the commission of any offence. On to Scheer’s last three situations, which are all similar — so let’s deal with those together. Situation: A gang member tells someone to steal a car, or commits aggravated assault or tells someone to commit aggravated assault on behalf of a gang. Scheer’s claim: Under Trudeau, they get a suspended sentence or a fine. Scheer’s plan: They get a mandatory sentence in federal prison. Let’s call out the lie first. A gang member (or anyone) who permanently wounds or mains someone — in any circumstance — will almost never receive a suspended sentence or a fine. Just because a sentence is possible does not mean it is at all likely. To illustrate this point, let’s turn Scheer’s twisted logic back at him. Currently, there is no mandatory minimum sentence for manslaughter. This means a sentence anywhere from a small fine to life in prison is possible. So, under Scheer’s plan, can it be said that a gang member who commits manslaughter will receive only a suspended sentence or fine? Of course not. But there is nothing in Scheer’s proposal that would change the possible sentence for manslaughter. So why is Andrew Scheer soft on gang manslaughterers? Scheer’s solution to the strawman he has built is minimum sentences. This is not surprising. Minimum sentences are the first chapter in the Conservatives small-minded justice playbook. And like much of Conservative justice policy, it sounds tough but simply doesn’t work. All the available evidence shows that minimum sentences don’t deter crime. Even worse, minimum sentences have been shown to lead to higher rates of recidivism and less safe communities. They also have been shown to be a major factor in our country’s ever-increasing court delays. Scheer not only misrepresents the current legal framework and realities in the justice system but he proposes a solution that won’t reduce crime and will exacerbate the delay problems in our courts. Oh, and minimum sentences after minimum sentences — in addition to much of Stephen Harper’s criminal justice laws — have already been found to violate the Constitution. If Scheer is going to mislead Canadians, he could at least do it in a way that doesn’t violate the Charter. There you have it. Andrew Scheer’s plan to crack down on gangs and make Canada safer is built on a misleading foundation. Scheer misrepresents the current state of the Criminal Code, he lies about soft sentences being handed out under Trudeau and he provides an overly broad and oddly specific list of non-fixes. There is a desperate need to revaluate how we tackle gun violence in this country. But Scheer’s proposals do us all a disservice. Not only will they not work but they muddy the intellectual waters of this important policy debate. It is unfortunate that when there is so much to be critical of when it comes to Liberal justice policy Scheer has decided to drink the leftover Harper Kool-Aid. I agree with a lot of what you wrote. However: "And courts tend to frown upon laws that are so broad and vague that they could result in the deprivation of liberty without the commission of any offence." Uh-huh. Unless they are aimed at gun owners. Then deprivation of liberty and basic rights (i.e. the Firearms Act and associated Criminal Code S92) is cheered on by leftist judges and crown prosecutors. "do it in a way that doesn’t violate the Charter" The Charter is not worth the paper is it written on with the notwithstanding clause negating any right at the whim of government and the courts. Canadians need to have their rights absolutely enshrined so that no court or government can take them away from Canadians with a law or court ruling. In short, malum prohibitum laws have got to go. What we also need is consequences for judges who let out violent criminals who go on to reoffend, especially if they reoffend during their parole period. Right now there are insufficient consequences for judges making poor sentencing and parole decisions. Three strikes and the judge loses their job and forfeits their pension, sounds fair to me.